VITAMINS A & D. 38% LESS FAT THAN WHOLE MILK. AN EXCELLENT SOURCE OF PROTEIN & CALCIUM. FROM COWS NOT TREATED WITH RBST (NO SIGNIFICANT DIFFERENCE HAS BEEN SHOWN BETWEEN MILK DERIVED FROM RBST-TREATED COWS AND NON RBST-TREATED COWS). GRADE A. PASTEURIZED. HOMOGENIZED. 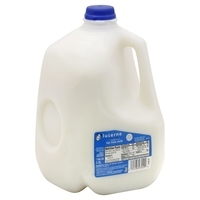 1 CUP SERVING WHOLE MILK: 8 G FAT; 30% DV CALCIUM; 8 G PROTEIN. 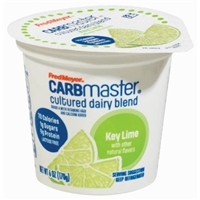 1 CUP SERVING REDUCED FAT MILK: 5 G FAT; 35% DV CALCIUM; 10 G PROTEIN. 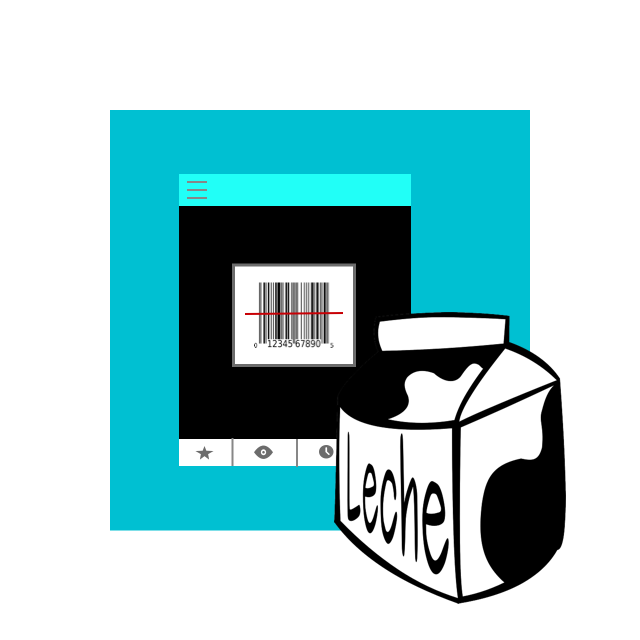 3-A-DAY: MILK, CHEESE, YOGURT. PRODUCT OF USA. Grade a reduced fat milk, fat free milk, vitamin a palmitate, vitamin d3. 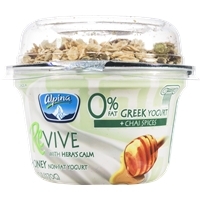 Greek strained yogurt: cultured pasteurized grade a nonfat milk, honey, live yogurt cultures. Granola: oats, pistachios, honey, hemp seeds, crystallized ginger (ginger, sugar), canola oil, spices (cinnamon, ginger, cloves, cardamom), salt. 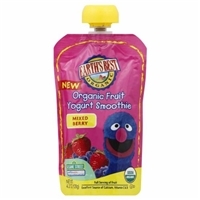 EARTH'S BEST® ORGANIC MIXED BERRY FRUIT YOGURT SMOOTHIE. NEW. 123 SESAME STREET®. HEALTHYHABITSFORLIFE. A GREAT START TO A LIFETIME OF GOOD HEALTH. USDA ORGANIC. FULL SERVING OF FRUIT. EXCELLENT SOURCE OF CALCIUM, VITAMIN C & D.
Organic pears, water, organic yogurt (organic cultured pasteurized milk), organic strawberries, organic blueberries, calcium citrate, ascorbic acid (vitamin c), citric acid, vitamin d.
Cultured pasteurized grade a lowfat milk, sugar, nonfat milk solids, modified cornstarch, papaya puree, fructose, kosher gelatin, natural flavors, locust bean gum, pectin, citric acid, potassium sorbate (to maintain freshness), sodium benzoate (to maintain freshness), calcium chloride and annatto (color). 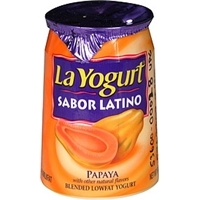 Cultured pasteurized grade a lowfat milk, sugar, nonfat milk solids, modified cornstarch, banana puree, fructose, kosher gelatin, natural flavors, locust bean gum, pectin, citric acid, potassium sorbate (to maintain freshness), sodium benzoate (to maintain freshness), annatto (color) and calcium chloride. 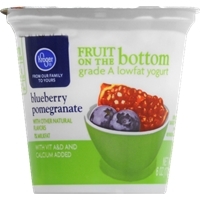 Ingredients: nonfat yogurt (cultured pasteurized nonfat milk. Live and active cultures: s. Thermophilus, l. Bulgaricus, l. Acidophilus, bifidus and l. Casei). 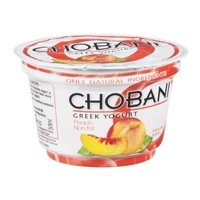 Fruit on the bottom (peaches, evaporated cane juice, pectin, locust bean gum, natural flavor). 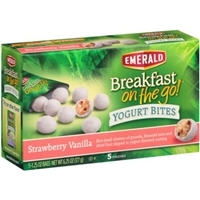 Brand/Manufacturer: Emerald Diamond Foods, Inc.
Yogurt-flavored coating (sugar, partially hydrogenated palm kernel oil, calcium carbonate, yogurt-flavored powder (cultured whey protein concentrate, cultured skim milk, yogurt culture), artificial color, soya lecithin, natural flavor), granola cluster (whole rolled oats, rice flour, brown rice syrup, sugar, almonds, dried strawberry pieces (strawberries, sugar, ascorbic acid), vegetable oil (canola and/or safflower and/or sunflower oil), oat fiber, salt, natural flavor, barley malt syrup, amaranth, barley, quinoa, vanilla extract), natural strawberry flavor, citric acid. 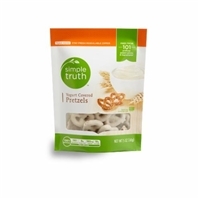 Yogurt coating (evaportated cane juice, fractionated palm kernel oil, nonfat yogurt [cultured whey, nonfat milk], soy lecithin, lactic acid, pure vanilla, salt), pretzels (unbleached enriched flour [wheat flour, malted barley flour, niacin, reduced iron, thiamin mononitrate, riboflavin, and folic acid], salt, malt, yeast and baking soda). 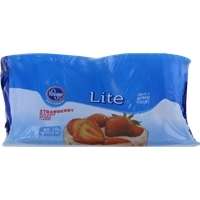 Cultured nonfat milk, strawberries, modified corn starch, whey protein concentrate, natural flavor, gelatin, tricalcium phosphate, soluble corn fiber, pectin, agar, malic acid, cultured dextrose, sucralose, neotame, acesulfame potassium, red 40, vitamin a palmitate, vitamin d3, and active cultures with l. Acidophilus, bifidus lactis, bifidus bifidum, lite nonfat yogurt has 80 calories, regular nonfat yogurt has 160 calories per serving. 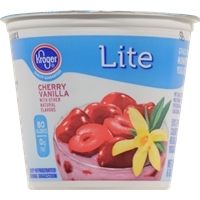 Cultured ultrafiltered nonfat milk, sugar, cherries, corn starch, cherry juice, natural flavor, vegetable juice (for color), pectin, rebaudioside-a*, lemon juice, vitamin a palmitate, vitamin d3, and active cultures with l. Acidophilus and b. Bifidum. 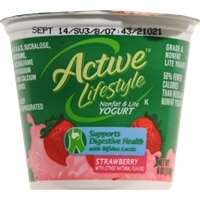 Cultured nonfat milk, strawberries, modified corn starch, whey protein concentrate, natural flavor, gelatin, tricalcium phosphate, soluble corn fiber, pectin, agar, malic acid, cultured dextrose, sucralose, neotame, acesulfame potassium, red 40, vitamin a palmitate, vitamin d3, and active cultures with l. Acidophilus and b. Bifidum, lite nonfat yogurt has 80 calories, regular nonfat yogurt has 160 calories per serving. 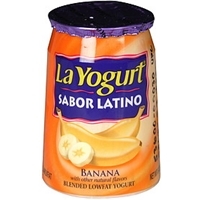 WATER, MILK PROTEIN CONCENTRATE, WHEY PROTEIN ISOLATE, CREAM, KEY LIME PUREE, CONCENTRATED LIME JUICE, TRICALCIUM PHOSPHATE, MODIFIED CORN STARCH, NATURAL FLAVOR, SODIUM CITRATE, TURMERIC (FOR COLOR) GELATIN, CITRIC ACID, SALT, PECTIN, AGAR, CULTURED DEXTROSE, SUCRALOSE, ACESULFAME POTASSIUM, BLUE 1, VITAMIN A PALMITATE, VITAMIN D3, ENZYMES AND ACTIVE CULTURES WITH ACIDOPHILUS AND B,. BIFIDUM. 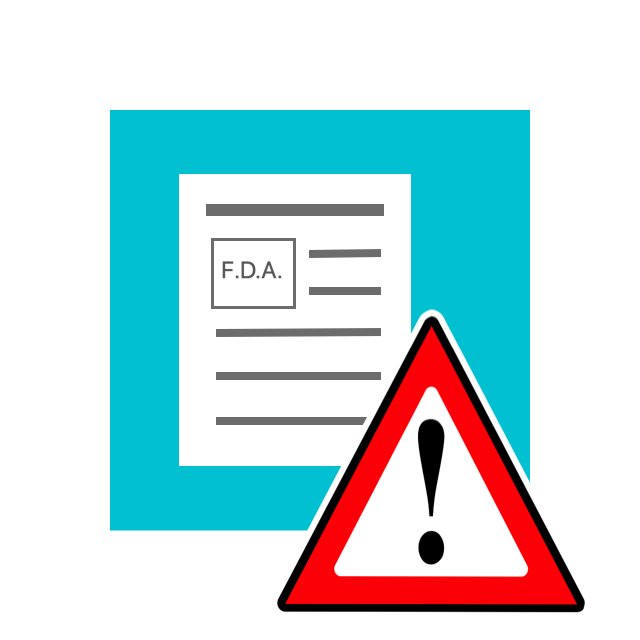 Cultured lowfat milk, sugar, blueberries, nonfat milk, pomegranate juice, modified corn starch, gelatin, tricalcium phosphate, natural flavor, pectin, agar, cultured dextrose, blue 1, red 40, citric acid, vitamin a palmitate, and vitamin d3 and active cultures l. Acidophilus and b. Bifidum. 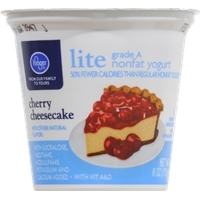 Cultured nonfat milk, cherries, cultured milk and nonfat milk, modified corn starch, whey protein concentrate, natural flavor, gelatin, tricalcium phosphate, soluble corn fiber, pectin, agar, citric acid, cultured dextrose, lactic acid, sucralose, neotame, acesulfame potassium, vitamin a palmitate, vitamin d3, and active cultures with l. Acidophilus and b. Bifidum.contains: milk. 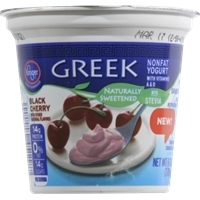 Cultured nonfat milk, cherries, modified corn starch, whey protein concentrate, natural flavor, gelatin, tricalcium phosphate, soluble corn fiber, pectin, agar, malic acid, cultured dextrose, sucralose, neotame, acesulfame potassium, vitamin a palmitate, vitamin d3, and active cultures with l. Acidophilus and b. Bifidum.contains: milk.